Anel Grobler of Spit or Swallow gets to grips with blending brandy. Some time ago, I was fortunate enough to be invited to a brandy blending experience hosted by the renowned brandy master and director of primary production for Distell. The experience was held at the Van Ryn’s Brandy Cellars in Stellenbosch, and here at one of the oldest distilleries in the country, I discovered a new appreciation for the craft of making brandy. The skill itself going into producing and aging brandy is astounding in its own right, and indeed a true science. But when it comes to actually blending brandy to get a final product, a whole new level of skill and experience is required. The base theory behind blending is that each 300 litre barrel of matured brandy is different to the next, depending on base wine used, barrel and degree of toasting used, as well as age of maturation. 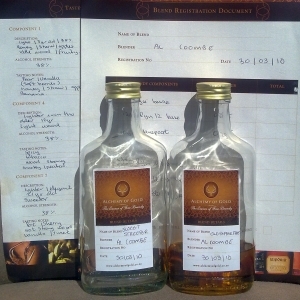 Of course by controlling elements of the process during production, the end matured brandy can be kept relatively consistent, but there are variations which need removing to ensure that any one bottle of the same brandy shows the same characteristics and taste as another one, and hold this taste profile year on year as new batches are released into the market. Much like whiskey, this is all in the art of blending brandy. Our blending brandy experience with Johan Venter began with a tour of the Van Ryn’s Distillery, a must see for any enthusiast, or even just anyone curious about large scale spirit production. It starts off with a brilliant welcome cocktail, a most surprising mix of Viceroy Brandy and Apricot juice, served in a snifter with ice. A most pleasant start to proceedings and a very quaffable summer cocktail drink! This is followed by and informative tour of the different stills used in distillation and a barrel making demonstration by Oom Albie, one of few remaining barrel smiths in the country. 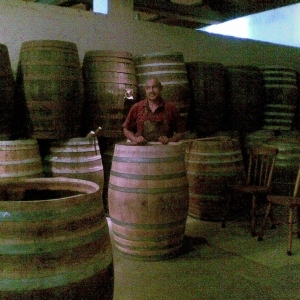 The distillery tour is concluded with a visit to the the maturation cellars, where row upon row of brandy filled oak barrels line the floor patiently allowing nature to work its magic of transformation. The angels share (evaporated brandy – up to 30% over its lifetime in oak !) hangs thick in the air and temptingly hints at the great things to yet to come from this cellar! After our tour we were led into one of the beautiful old board rooms in the distillery, and met with a spread of scientific glass equipment, 8 base brandies, tasting note sheets and a beaming Johan Venter eager to educate us all in the art of blending brandy. The base brandies we used varied widely from base wine cultivar and maturation, some had been in oak for over 20 years. Each brandy was explained to us and we went through a process of nosing and tasting, to document the individual characteristics of our base brandies. Next came the recipe. What type of brandy do we want to make. What final characteristics do we want the brandy to have in terms of spice, fruit, colour, smoke, wood, and many other sensory drivers. And in what proportions do we need to mix our base brandies to achieve this final recipe. Two critical factors play a role in blending brandy. Your nose and your palate. When appreciating fine brandy, the first real sensory exposure smell. And what the nose smells, the palate expects to taste. Easier said than done. We quickly worked out that the aromas given by the brandy often did not correlate in any way to the final taste when sampled. Some beautiful noses resulted in very flat flavourless tastes and vice versa. After many recipe tweaks, quantity alterations, updates and disapproving looks from our mentor, most of us were able to get a final blend decent enough to warrant bottling. And bottle we did. Sweet Streeper was the second one bottled to a different recipe, that was a lot older and more mature, smoky and smooth (Van Ryn’s 10 and 12 year old base, and Oude Meester’s 12 year old base). Unfortunately when it came to making up my final blend for bottling, I managed to get proportions a little wrong – an indication that your final blend is not the same as your test blend…oops. But it was still good, or at least it was to me. They are all but gone now, after all what is the purpose of brandy if not to be enjoyed! All in all an amazing experience for an amateur enthusiast, and one that taught me a massive amount about brandy. Blending brandy experiences are not open to the public, but distillery tours and brandy tasting at Van Ryn’s are a must – even if you don’t like brandy. Tasting and pairing options are available from brandy and chocolate to brandy and Charcuterie (dried meats).